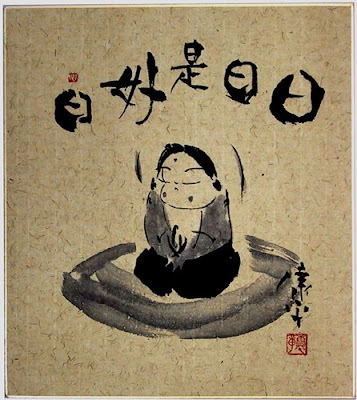 A Japanese Zen Buddhist proverb at least 300 years old which means "Every day is a good day", or "All days are good days". 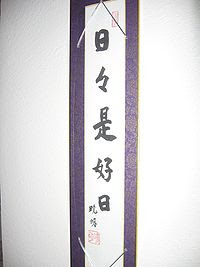 It has been presented by some Zen masters (notably, Kodo-Sawaki and his disciple Taisen Deshimaru) as a kōan, that is, a statement that appears contradictory to rationality but that can be grasped through intuition. It was a favorite saying of the avant-garde composer John Cage. 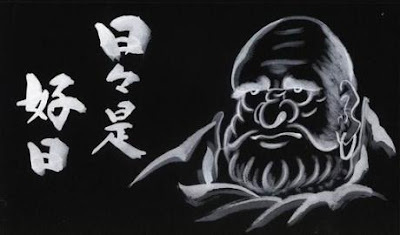 Look here for many more beautiful calligraphy pieces.
. . . CLICK here for more paintings by Takagaki sensei !
. My Fusuma sliding door paintings .
. nichi nichi kore kōnichi 日々是好日 Every Day is a Good Day .